Fairtrade America and Mayorga Organics will serve free coffee at Saturday’s annual Passport DC event to showcase Bolivia’s commitment to its farmers. Visit the embassy, have a free cup of Fairtrade organic Bolivian coffee out of the Mayorga Organics food truck, watch traditional dancing, peruse craft tables and enjoy regional food. Each year, embassies throughout Washington, DC, open their doors to the public to shine a light on the respective culture for Passport DC, a one-day event that attracted over 30,000 visitors last year. 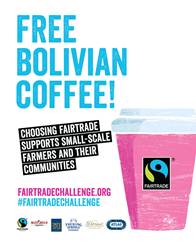 This year, the Bolivian Embassy will also highlight Fairtrade, organic coffee grown by small-scale Fairtrade coffee farmers and roasted by Rockville, Maryland-based coffee roaster, Mayorga Organics. This Saturday, May 7, from 9AM - 4PM ET, Mayorga Organics will station their food truck outside of the embassy to give away thousands of cups of Fairtrade, organic coffee from Bolivia. The beans were donated by Atlas Coffee Importers and are certified Fairtrade by the DC-based non-profit, Fairtrade America. So what makes Saturday’s Passport DC event even more globally significant? This Bolivian coffee break kicks off a week-long celebration within the Fairtrade community that leads up to World Fair Trade Day, a yearly celebration that unites nonprofits, certifiers, campaigners, businesses and producers around the world. This year marks the launch of the first global Fairtrade campaign—the World Fairtrade Challenge. The WFC campaign is designed to raise awareness of issues faced by coffee farmers, so educating embassy visitors about the hard-working people who grow their specialty coffee was an ideal fit. To further showcase Fairtrade America’s commitment to shopping with ‘LOFT’y (local, organic & fair trade) principles, the NGO is partnering with two sustainably-minded companies to sweeten the deal for Saturday’s embassy coffee break. Tate & Lyle will provide Fairtrade certified sugar and flavored coffee syrups. Trickling Springs Creamery is donating their local, organic cream for those who prefer their coffee drinks on the lighter side. Ensuring that the masses are ethically caffeinated will keep the Fairtrade America staff busy, but Passport DC offers many additional cultural activities for the entire family. Fairtrade America works with farmers and workers, businesses and consumers to make trade fairer. For more information on this week’s embassy coffee break, the Fairtrade Challenge, World Fair Trade Day or to arrange an exclusive interview with Fairtrade America’s Executive Director, Hans Theyer, contact Jason Myers at jason(at)contentfac(dot)com.